UPDATE 1/24/18: Final glorious send-off to this ObamaTron Master Planner now documented on film at her 2016 Election Night party celebrating Hillary’s “Victory!” Alas, something went wrong, terribly wrong. For Sam and her all-girl attendees there to toast the proverbial shattered glass ceiling, this film footage documents a special sort of Kristallnacht…and provides a jolly bit of Schadenfreude for some of us. This way to the egress, honey! 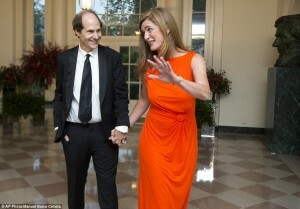 Former Obama Insiders and fun couple Cass & Sam tango their way right out the door. 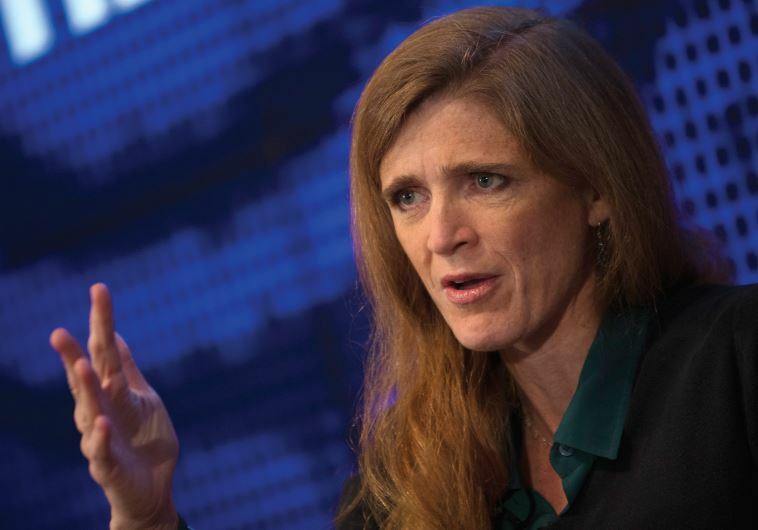 Garden-variety Ivy League Leftist Samantha Power has proven to be an ideal Obama lackey in her capacity as his appointed UN Ambassador. Like her boss, she is fundamentally driven by hatred for Israel and America and sympathetic toward any movement, regime or policy which would effectively undermine and destroy them. In her world view, America and Israel are not exceptional, proven beacons of light and freedom but rather the amoral scourge of modern life, the source of all the world’s ills. And like her sinister husband, former Obama Regulatory Czar Cass Sunstein, Power is one of those ivory tower intellectuals prescribing One World rule under (self-designated)morally and intellectually superior Master Planners like herself. Unfortunately, the Obama/Power prescription of downgrading the American/Israeli presence on the world stage has only led to an explosion of the genocide and unchecked savagery these Leftists claim to deplore. Loss of Iraq to ISIS for instance. Syrian genocide for another. The slaughter of Christians throughout the Middle East. America-haters like Power have much to answer for, but don’t expect any apology from them…as they have demanded from America and Israel for simply existing. Our deranged UN Dragon Lady eager to get those bony fingers into your life.